Saanich Councillor, Nathalie Chambers, suggested the idea of a Town Hall where experts could discuss the urban forest. The following poster gives an overview of the event. The event will be held at the Horticulture Centre of the Pacific at 505 Quayle Rd. In addition to several formal presentations, listed below, the facilitator will call for questions and comments from the audience. Donations gratefully accepted at the event. Please RSVP treelove@falaise.ca if you plan to attend. 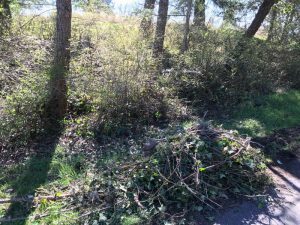 We are continuing our work to remove ivy and blackberry from our park. We will be weeding under the trees and digging out blackberry roots in the back corner. New volunteers are always welcome. We hope you can join us. Bring: gloves, pruners , hand rakes. Other tools and refreshments are provided. We also need mattocks for digging out those tenacious blackberry roots if you have one. Our first work party for 2019 is slated for Thursday, January 31 from 10 am to noon. 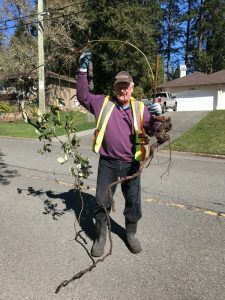 As mentioned in the last newsletter our native trees and shrubs order has arrived and a Saanich Parks crew will be planting them during the Work Party. If you can spare a little time that morning to lend a hand with your spade it will be appreciated! Questions : call Stuart at 250 415 1739. We’re kicking off the year with a Family Day Social Event! This is a great opportunity for young families to come out and meet each other and for everyone in the community to connect. It is a free event at the Women’s Institute Hall (4516 W Saanich Rd) from 2 to 4 pm on Family Day February 18th. We will have snacks and drinks and activities for both kids and adults. There will also be a play area for smaller kids. To help protect the floors please bring indoor shoes to wear. There is parking available for several cars, and we can arrange to drive those who may not be able to get to the hall. If you have any suggestions, or would like to help out, please contact us at info@falaise.ca. Work on improving Falaise Park will continue on Saturday, November 17th from 10:00 am to 12:00 pm. Join us in the park to pull invasive weeds, spread mulch and bond with your neighbours. Tools will be provided and refreshments will be served. For more details, contact Stuart Macpherson at 250- 415-1739. Annual General Meeting, Saturday, November 3, 2018. The AGM will be held on Saturday, November 3, 2018, from 7 to 9 pm, in the Fireside Room at the Gateway Baptist Church. The church is located at 898 Royal Oak Ave and anyone needing a ride to the meeting can contact the FCA President at president@falaise.ca. One of the objectives of the meeting is to elect the directors who will serve for 2019. Ideally, six directors will be elected, although the constitution allows for a minimum of three. At their first meeting, the directors will elect from among themselves a President, Vice-President, Secretary, Treasurer and Registrar. In addition to the normal business, the AGM will feature a guest speaker. 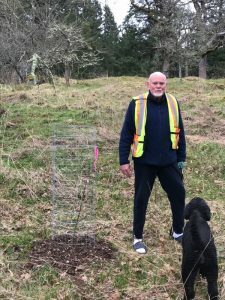 Mike Meagher of the Garry Oak Preservation Society has agreed to speak about their efforts to preserve the Garry Oak ecosystems in Canada. He is also prepared to answer questions from the audience.